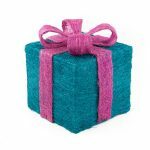 Use our gorgeous 20cm Teal Sisal Gift box with a deep red bow to add extra depth and originality to your Christmas display. Stack Teal Sisal Gift Boxes with some Gold Sisal Gift Boxes of different sizes to create an extra decorative touch around your Christmas tree, or give a friend their gift inside one of these gorgeous boxes and know that they are also getting a gift box that is worthy of any gift! Our Teal Sisal Gift Boxes can be flat-packed after Christmas and used again the following year. Simply store them somewhere dry and dust free until Christmas comes back around.